Once you know which view you want, you need to select which surveys you want to view. Notice that your surveys are arranged by categories. In the Pancreatic Cancer Action Network example above, the categories are ‘Basics’ and ‘Test Results and Scans.’ Participants also see these categories in the ‘My Data’ view of their dashboards. The categories correspond with BLANK, and you can easily edit these categories by BLANK. The participant data view is best used for case management, because it enables you to look at data that corresponds to each participant. For example, you can use this feature to see which participants have yet to complete their survey, filter these participants, grab their contact information (if you have permission to view it), and re-engage those participants to finish their surveys. Next, hover over ‘Additional Columns’ to view the columns. Every profile has its own foreign key as its User ID to identify participants anonymously. Remember that participants can create multiple profiles from one account; in PEER, every profile is given a unique foreign key as its User ID rather than each account. You can therefore use the User IDs to send messages to participants within PEER, and assign participants new surveys without their contact information. By clicking on the User ID, you can also view the participant’s survey responses. Currently, the ‘Date Assigned’ and ‘Added/Added By’ display the same information; however, the date reflected in both columns may represent different things; below is a clarification of how to interpret the dates displayed. 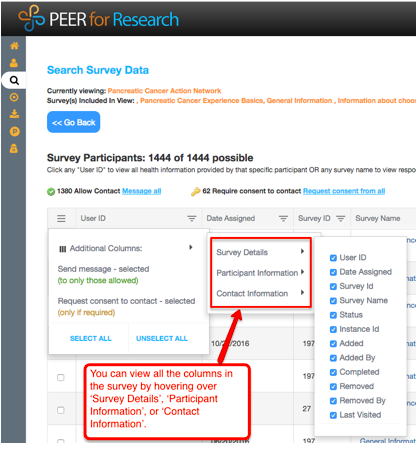 The date that is displayed under this column is the date when you turn the survey on, which automatically adds the survey to participants’ dashboard (this would have been done in the “Assign Surveys” tab of the PEER Survey Toolkit). Therefore, don’t be surprised if you see that participants have been assigned surveys before they created their accounts because this date reflects the date the survey was turned on, rather than when the participants began to fill out the survey. However, if the survey in question is something triggered by participants in the course of taking a survey (for example, your participant responds that they have purple toenails, and this triggers a follow-up survey about purple toenails), then the date reflected in this column will display the actual date the participant received the survey (That’s when this feature really starts to come in handy!). This information is especially helpful if you want to see the time gap between when a participant first creates an account (by looking at the date the profile was created) and when they first begin the survey (thus indicating that the survey was assigned to them). We’ve requested that this ‘Date Assigned’ feature be changed for the future so that it reflects the date that participants create their accounts so that it is easier to understand in the future. The ‘Added’ date is the same as the ‘Date Assigned.’ We are currently waiting for this to be deleted as part of future development and feature work for PEER. The ‘Added by’ shows the person who added the survey to a participant such as the administrator, the participant themselves, or a proxy, who acted on the participants’ behalf. If a survey was triggered or added by a participant, you will see ‘Participant’ in this column. If a survey was assigned using the PST ‘Assign Surveys’ tab, then you will ‘N/A’ (since these are present on participants’ dashboards as a default). If someone on your staff uses any of the options in the dropdown menu at the bottom right of the screen to add surveys (like “Assign survey(s) to dashboard” or “Assign new instance of survey(s) to dashboard”), you’ll see that admin’s username, as the person who assigned those surveys to participants. We’ve had some reports of this not displaying exactly right for certain users, so if something like that happens to you please let us know! This is one method of identifying your surveys, which is useful if you’re looking at multiple surveys simultaneously or exporting multiple surveys and would like to conduct additional analysis outside of PEER. This is the easiest way to identify your surveys, by its name. You can also view individual participant responses by clicking on the survey name. When a participant completes the survey, they will no longer see the survey on their dashboard, and can view their data from the survey in the ‘My Data’ tab on their dashboard. This means participants are partially through the survey. Participants can stop and take a break from their surveys at any time, and their responses will be saved automatically. However, we encourage participants to log out rather than leaving the survey on idle because the session will automatically time out and participants will be logged out, which sometimes affects which responses are saved. 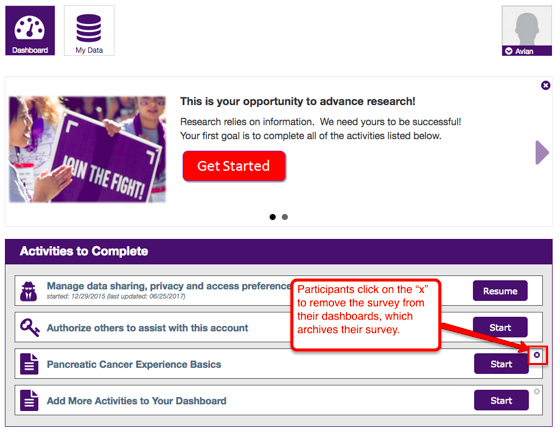 When participants are ready to finish their surveys, they can easily log back in and find a ‘Resume’ button next to the survey they need to complete. This means the survey is available on their dashboards for them to take, but the participant has not yet started. 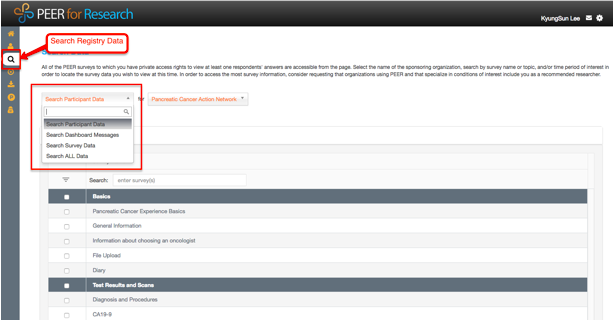 Administrators can also trigger to status by clicking on the status associated with each participant. 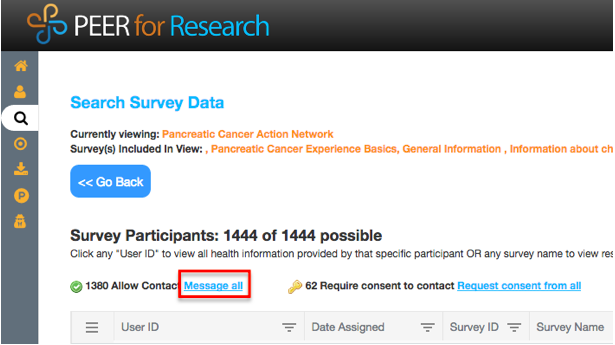 When you hover over a participants’ status, a blue bubble will appear that says, ‘Remove from dashboard,’ which will automatically remove the survey from the participants’ dashboard and change the status to ‘Archived.’ Administrators may do this if participants should not have received a specific survey and/or was requested by the participant to remove this survey on their behalf. It is important to keep in mind that there is no true delete button in PEER For both participants and administrators. Although a participant removes the survey from their dashboards, administrators and participants can still see data from this survey (if there was data entered). Conversely, if you would like to re-add a survey that was previously archived, for example, if a participant accidentally removed the survey from their dashboards, then you can click on the survey status of the participant, which will change the status back to the status it was prior to being archived. This survey status appears for those participants who have not yet triggered a particular survey. This status is generally applicable for groups with multiple surveys; for example, if they have an introductory survey and a caregiver survey, but the caregiver survey is only triggered (or assigned) if a participant indicated that they are a caregiver in the introductory survey. The unassigned status means that participants were not given the survey because they either have yet to trigger it because they have not started any of the surveys, or they did not trigger it at all because they need not meet the requirements to trigger the other surveys. This shows the number of times a participant has taken a particular survey. This is particularly useful for longitudinal surveys, where participants can take the same surveys multiple times. This is the name associated with the profile rather than the name associated with the account used to create a profile. See below for further clarification. The contact person is the name of the contact associated with the account the profile was created in. For example, if you created a profile on behalf of your mother, then next to your mom’s unique foreign key user ID, the contact information from the account in which you created her profile would be displayed in this column. You can easily see how a User ID is related to the contact person if the profile name and contact name are different. If it says “spouse” for example, then it means that the person listed under participant first name and participant last name is the spouse of the person listed under contact first name and contact last name. In this case, the person listed under the contact first and last name used their own account to create their spouses’ profile. On the other hand, if the relation says “self” then this means that the participant listed under participant first and last name should also be the person listed under contact first and last name, which means they are the ones who created their own profile using their own account. This date reflects the date that a participant created his/her profile. This is also the date you should use to determine when a participant joined your registry. This shows who and when a survey was removed, or archived, from a participant’s dashboard. This date refers to the last date that a person started or resumed a survey. You can also edit a participant’s survey responses. From an IRB standpoint, this is allowable without having written documentation requesting the participant’s permission. The IRB assumes that you are making modifications based on the participant’s request or based on existing records. For example, if you have previous medical records from Participant A that state their birthday is on June 27 but in PEER you see that their birthday was recorded as June 26, you can edit the survey to reflect the appropriate date. You can modify a participant’s survey response by either clicking on the participant’s foreign key in the User ID column or by clicking on the survey name in the Survey Name column. You can easily re-assign or remove surveys from this participant data level view. You can do this by going to the ‘Status’ column. If the survey status says ‘Archived’, selecting on the status will re-assign the survey back to the participant’s dashboard. If the survey status says ‘Unassigned’, then clicking on the status will assign the survey to the participant’s dashboard. If you are unsure of what will happen when you click on the status, you can hover over the status and a blue bubble will appear with further details. Another method of assigning or removing surveys for participants is to filter and select the participants you want by checking the box next to their foreign key user ID, scrolling to the bottom of the table (which is also called a kendo grid), and selecting the option that says, ‘Assign Survey(s) (to dashboard)’ or ‘Remove survey(s) (from dashboard)’. 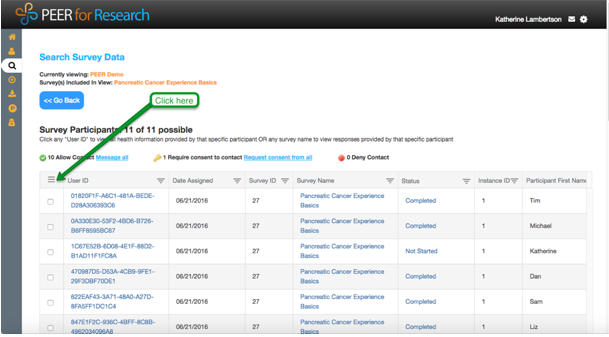 This is an easier way of assigning or removing surveys for one, a few, or batches of participants. You can also assign a new instance in this same drop-down menu, which enables participants to take a survey that they have already filled out again. Currently, administrators cannot delete a participant’s profile or account. If you would like to delete a participant’s profile, please contact the PEER team at gro.ecnaillaciteneg|reep#gro.ecnaillaciteneg|reep with a reason for why you want to delete each participant’s account. Also keep in mind that the PEER team can only delete participant profiles, not participant accounts. The ‘Search Participant Data’ view is also where you can go to export your data. If you scroll to the bottom of the table (also called a kendo grid), you will see a menu that says, ‘Select Action.’ From there select ‘Export user data’ if you would like to download the data as a Comma Delimited or Excel file. You can also download the entire table as a PDF or export the data as a table. 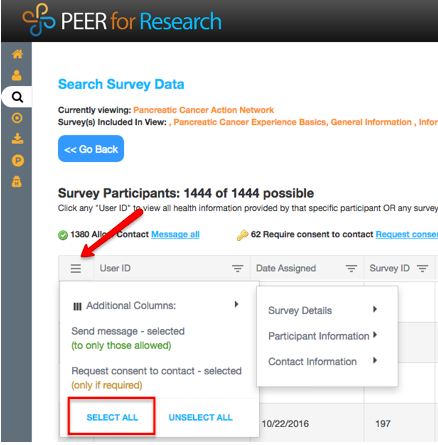 You can also message participants through PEER without having to use the participant’s contact information. This will send a message directly to the participant’s dashboard, and is particularly useful when participants have not enabled you to view their contact information, and you would like to request it. This feature is also useful if you need to message a sub-set or all participants about your survey such as a new survey that is available or a reminder to finish taking their initial surveys. You can select the participants you want by using the filtering options or by navigating to the menu, which is located next to the ‘User ID’ column in the form of 3 underlines, and selecting ‘Select All.’ You can then select the ‘Message all’ blue link right above the ‘User ID’ column to send a message. Using the 'Search Survey Data' view, you can look at survey data on an aggregate (macro) level. For example, you can use this feature to the look at the overall percentage of participants who have indicated that they are female versus male, or those who have completed versus still in progress their surveys. This search displays your registry using data visualization tools such as bar graphs and pie charts. 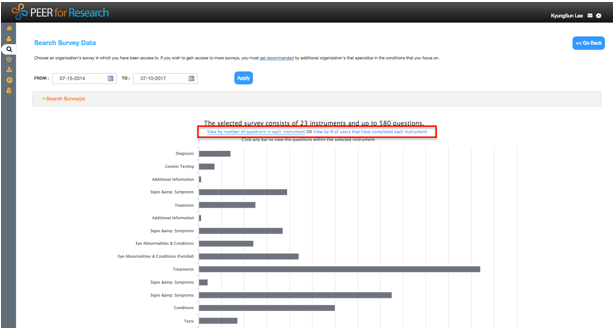 The default view is the number of questions in each instrument in your survey. However, you can also view the percentage of overall responses for each instrument by selecting on the 'View by % of users that have completed each instrument' (as seen below). Keep in mind that you can view percentages only to view the overall responses for each instrument. You can also click on any of the graph bars that correspond to each instrument to look at question-level and response-level statistics. As an example, you can click on the 'Diagnosis' instrument to view the number of user responses for every question in this instrument. If you then click on the first question, you can see the number of user responses for the responses for that question. In addition, if you scroll down to the bottom of the page, a green pie chart shows the current percentage of participants who have completed the survey compared to the percentage of participants who are still in progress of filling out their surveys. To view the specific participants in each category, click on the relevant pie slice, and you will be taken to a table (also called a Kendo grid) that shows those specific participants. IMPORTANT: Keep in mind that the system does not track information about the number of participants who did not receive questions due to branching logic. You’ll only see numbers for responses, or for skipped questions. Overall, be sure to hover over the bar graphs to see further information on what each bar shows. In addition, below are a few suggestions on how you can also interpret the data in the 'Search Survey Data' view. At the bottom of the green pie chart you will see the total number of participants in your registry, which is the total of participants who have both completed and are in progress of completing the surveys. If you click on the total figure (in blue with an underline), the system will take you to the 'Search Participant Data' view, where the total number of participants will also be displayed at the very top. Looking at the instrument-level number of users who have responded in the instrument is helpful in determining where participants are dropping off. For example, if your data shows that only 50% of participants completed the Surgery instrument, while 80% of participants completed the instrument previous the Surgery instrument, then this can signal that participants are stopping the survey somewhere before or after the Surgery instrument. You may want to look further into this to see if there are too many questions within the Surgery instrument that is causing respondent burdens, if the questions are confusing to participants, etc. The dark gray bar shows the number of participants who have either skipped or not received questions. Be sure to hover over the gray bar to see which is applicable, as it will be different for each registry. We’re still working with Private Access to document the precise details of how statistics are calculated in the ‘Search Survey Data’ view, as this differs between different question types (For instance, for radio questions, the number of participants who responded to the question will always be the same as the number of answers to the question, but this will not be the case for multiple choice questions). If you’re looking in the aggregate view and see something that doesn’t make sense to you, please let us know, and we’ll try to help explain! The aggregate data view has a few known bugs around more obscure question types and around longitudinal surveys. For instance, if you try to use the aggregate data view to drill down to the responses to a text entry question, and then attempt to pull up a table of the individual participants who entered a given response, the system sometimes returns “0” individual participants. This is not because the number is really 0, but because of an issue with an API call. Similarly, if you open a longitudinal survey (a survey designed for participants to take over and over again, such as the Surgery or Radiation surveys in the example portal), the system may have some difficulty calling the number of participants who are in complete or in progress. This does not mean that no one is complete or in progress on that survey – in fact, you can see how many are using the “Search Participant Data” view. It’s simply a display issue. If you encounter other idiosyncrasies that you think indicate a problem with display, please let us know! To go to the next section of Registry and Data Management, which looks at managing your data outside of PEER using Excel tools, please click here.